An average of 640 train journeys have been cancelled in Britain every day over the last year. In 2016, research by the Sunday Times was conducted to discover the UK’s most delayed train route. The newspaper announced the Gatwick Express train service as the most delayed in Britain, with more than 8,100 services arriving late in the six months prior to the survey. The Gatwick Express is a premium-priced direct rail link which travels between London Victoria and Gatwick airport. Research showed that 33.9% of Gatwick Express trains were at least five minutes late and more than 2,659 trains, which is about 11%, were either more than 30 minutes late or cancelled – that’s an absurd number! Being a direct route to the airport, many Britons rely heavily on this train to be punctual; running half an hour late or being cancelled could easily result in missing a flight! The Sunday Times also revealed that the country’s five worst routes were run by the super-franchise Govia Thameslink Railway (GTR). The second worst service turned out to be the London to Brighton route operated by Southern, which also forms part of GTR. A large 34,352 trains (32.8%) arrived more than five minutes late last year. Another survey, this time conducted by Which?, confirmed that 39% of passengers had experienced a delay on Southern trains, followed closely by Thameslink & Great Northern with 33% of passengers having been delayed. The big question is, has there been an improvement in 2017, or is the Gatwick Express still the most delayed route in Britain? 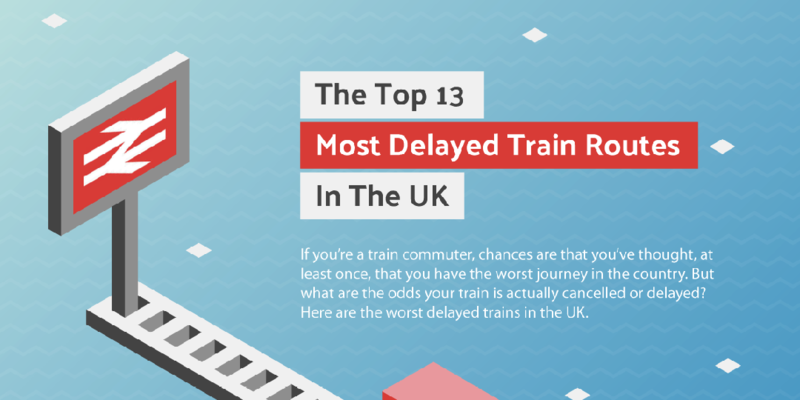 Our infographic counts down the thirteen most delayed trains across the country. We focused our attention on all the routes cancelled or delayed during the month of January 2017 to determine which lines the British can least rely on. We’ve also gone through Twitter to get your – yes, all of you who are reading this! – feedback on some of these routes. The 16:26 from Bedford to Brighton and the 06:57 from Brighton to Bedford trains are both featured in our infographic. This doesn’t actually come as a surprise seeing as Thameslink operates this line. The chances of the Brighton to Bedford train running late are quite high, and according to our calculations, there is a possibility that it can get cancelled. Check out our infographic for the odds and see what others have to say about this route. The 16:00 and 18:00 from Manchester Airport to Edinburgh trains both seem to have a lousy reputation. They are run by TransPennine Express (TPE). Last year, 30% of passengers were late thanks to this operator. One frequent passenger confirms the high likelihood of being delayed on these trains and another doesn’t have anything positive to say about its employees. Travelling from Edinburgh back to Manchester isn’t much better (especially early in the morning at 06:15) as research shows that 27% of these trains arrive later than 20 minutes. Scottish cities must be cursed with tardiness, as the 04:22 from Glasgow Central to the same airport isn’t that punctual either. In London, the average train was delayed by three minutes 40 seconds, while in the south-east a typical journey is held up by five minutes 45 seconds. Only in Scotland were trains less punctual. Perhaps it’s for this reason that Edinburgh’s notable clock is five minutes fast, to enable travellers to catch their train. Are you heading to Waterloo? You might want to change your final destination as several trains which are run in that direction seem to either be delayed or cancelled even! The 07:14 from Alton, the 07:02 and 07:32 from Woking, and the 6:51 from Southampton Airport Parkway all experienced frequent delays last January. And what about any cancellations? All these trains have been delayed plenty of times, but are they likely to get cancelled? What are the odds? Have a look at our infographic below to discover which train takes the title for the worst line in Britain for 2017. You might actually have better luck winning a game of Roulette with system play than arriving at your destination on time using these trains!